We are leading firms in the industry, engaged in manufacturing and supplying quality approved range of Machine Tools. 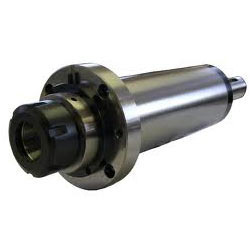 Our product range includes Machine Tool Spindles and different others. We offer them in different technical specifications and can be customized as per the requirement of our clients. We are counted amongst the reckoned names in the industry, offering an extensive range of Machine Tool Spindles that are valued for dimensional accuracy and sturdiness. We offer them in different technical specifications and can be customized as per the requirement of our clients. Our entire product range is performance oriented and is as per the set quality standards and norms. Furthermore, we offer them at most affordable rates.